The small, narrow, secluded, slow-moving coastal streams called Bayous cut through tranquil forests. The Cajun people who live in these American waterways have a rich culture of music and food, and an interesting history. Though some roads now crisscross the bayous, the boat is still the most efficient means for many denizens to get around. Tours from New Orleans are readily available. The waters are shallow, so the craft has to be a pontoon boat, airboat, or other shallow-bottomed vessel. 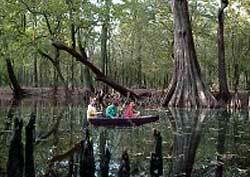 While most New Orleans based tours go to bayous near that city, the ones farther west offer several advantages. You'll get a more authentic feeling of bayou life. The surroundings will be quieter (fewer motors running). Sometimes your vessel will be the only one in your neck of the woods. The waters teem with alligators (locals call them "gators"). They can grow 15 feet or so in length. Though normally extremely circumspect, alligators will come very close to your boat because they have become habituated to receiving free handouts from the tour boat guides. Be sure the hand out isn't yours.